Richard on Silly Syllogism or not? I just figure, it’s MY picture that I took. If I upload it here, at least then I have a URL to cite. Feel free to share - I need all the help i can get! By Richard in Literature on October 14, 2015 . Great picture!!!! And so timely considering our readings (and yes, I realize that’s what you shared it, lol). What connections did you feel to this locale when visiting? And now? Well, first it was quite a climb, but the Greeks wer pretty clever. They built the paved roads leading to the Temple and beyond very level, so only the bends in the road were steep. 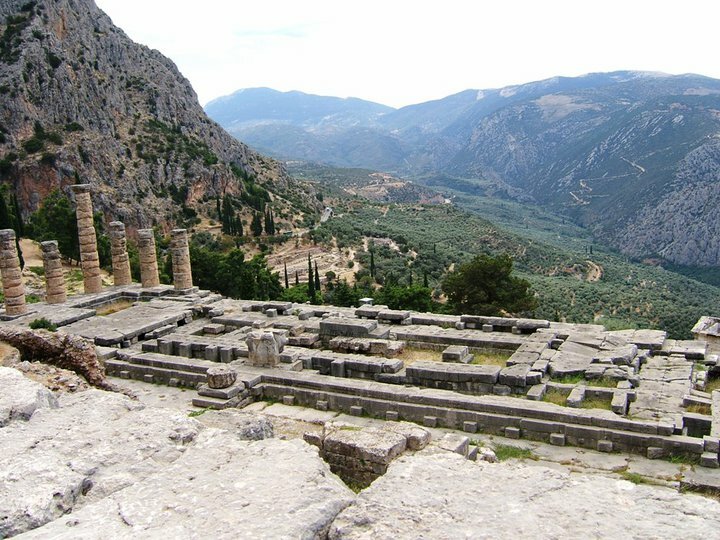 The pic is the actual Temple that “housed” the Oracle of Delphi. The Oracle was actually a young priestess, never over 19, who was fed various “concoctions” that brought on hallucinations. She would be in a room beneath the Temple, out of sight. Priests would ask questions for worshippers. Her “delirious” replies came through a pipe behind the altar that actually amplified her voice. For how it relates to our studies, there were so many auditoriums, theaters and areas for public speaking. It must have been an experience to have sat and listened. Capstone for MA in English has Begun!